Go green with bamboo! Bamboo flooring is a great eco-friendly flooring option because it is made of a renewable resource. Since bamboo is actually a grass it grows at a much quicker rate than wood, taking only 10 years to mature. While bamboo is on the tougher side, it is not as scratch and dent resistant as previously thought. Instead, I’d rank bamboo as having the same hardness as an oak flooring. Price-wise you can expect to find bamboo as inexpensive as $1.99 SF. Though the average price of bamboo, is closer to $4.00SF. Eco-friendly carpets? Carpet may not be the first thing you think of when you’re considering going green, however some environmentally friendly carpet is making headway in this area. From PET polyester carpets that are known for being made from recycled plastics, to PTT carpets that are made from corn sugar. There is also a recycle program going on for a specific type of nylon carpets. These carpets are being taken from landfills and being recycled to make more carpet. The price starts at around $1.50SF and goes up to around $6.00SF depending on which style you choose. Linoleum is a great green choice. Don’t get linoleum confused with vinyl flooring, they are two different types of flooring. Linoleum is the only one that is made of all natural materials. These materials are linseed oil, limestone and recycled wood flour. Plus linoleum is anti-bacterial, which is what makes it a great choice for kitchens and bathrooms. Linoleum can be found as sheet goods on rolls, as tiles, or as click together planks. If you are considering the sheets goods type, it should only be installed by a professional. Sheet goods average around $5.00SF. Tiles and planks can be installed by do-it-yourselfer’s and range in price from $2.50SF to $6.00SF. Cork is one of the greenest flooring options! Because it’s the bark of the cork tree that is harvested, this means that the trees themselves are left standing. It takes about nine years until the bark grows back and can then be re-harvested. Cork flooring is sought out because of its comfortable cushioning surface. Because of this it is a great choice for people who like to cook and spend a great deal of time in the kitchen. It’s a huge help in reducing strain on your legs and back. Cork flooring comes in a glue down option as well as a click together style. Cork ranges in price with an average of $3.49SF but starts as low as $1.29SF. Reclaimed wood is an obvious green flooring choice. Reclaimed wood flooring is repurposed wood that can be anything from planks taken from old barns and buildings to old basketball courts and other wooden surfaces. It is a green flooring choice because it keeps those materials out of landfills and gives them new life. Reclaimed wood flooring ranges in price, depending on where it came from and how much was done to the surface prior to it being purchased. 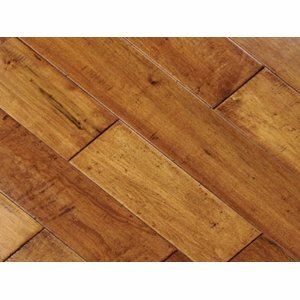 There are companies who sell reclaimed flooring that has been stripped, sanded and re-stained for as little as $6.00SF all the way up to $20.00SF. The budget-friendly way to find reclaimed wood flooring is to check with local thrift stores that specialize in building materials. These places offer flooring or tongue and groove wood planks that can be used for flooring, that will need more work from you but come at a fraction of the cost. No matter what type of green flooring you decide is best for your home, there is something for everyone!